White iPhone 4 Thickness Issues Caused By Quality Control? There are new reports coming in about the while thickness issue with the white iPhone 4 compared to the black iPhone 4. Consumer Reports have confirmed both the white and black iPhone 4 to have the same exact thickness when precisely measured using a caliper tool. 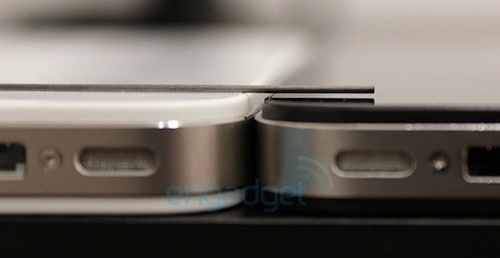 On the other hand, Engadget reported that their white iPhone 4 was 0.2mm thicker than the black version in the image below. This whole scandal is turning out to be what looks like a problem with Apple's quality control making the white iPhone 4. Apple's marketing chief Phil Schiller has confirmed that both the white and black iPhone 4 are exactly alike in terms of thickness. In the meantime, case companies like Otterbox have quickly put up fitment notes regarding incompatibility with their current iPhone 4 cases and the just released white iPhone 4.